Somebody’s child. Born out of love. Carried for nine months. Dead on the front page. Too obscene to forget. Too callous to comprehend. Somebody’s child. Reminding us that some of us are editors and can choose to put other people’s dead children on the front pages of their putrid tabloid newspaper, and some of us are mothers who weep for our dead children and some of us consumers who allow newspapers to feed our blood lust. Turn your face away. It is too much to bear. Too much to fathom that your life and your child’s life could end up being on the front page of someone’s putrid little tabloid. A day’s worth of newspaper sales. Your child’s life, all her smiles, and her discoveries, every flutter she made in your belly, every moment you marvelled at the wonder of human creation. Something that you made. Out of love. Reduced to a headline and a front page. Turn your face away. Wish it could be for good. It’s not the first time. They’ve done this obscene, crass and indecent injustice to somebody’s loved one. You know if it were their child, they would want to mourn in private. They would not want thousands of fingers on the face of their child. Taken in such a brutal way. Will this stop people from buying their driver’s licence? Will this stop people from the road rage? What do we do when we can’t take it anymore? Boycott? Try to ignore them out of existence? So that no other family will ever have to confront their loved one laid bare on the front page of a putrid tabloid again? So that children can have dignity in life and death too? Defenceless ones can rest in peace too? Innocent ones can maintain their innocence without the stink of those who try to capi-talise on human tragedy, whose desire for profit removes them from any connection to their humanity? Why do they think they can do this to us? Why do they think we will take it? Maybe we like it so. Maybe we are so inured now. So cynical about life and death that a dead baby on the front page of a putrid tabloid is no scene. Number one newspaper indeed. Good news newspaper indeed. Number one may be an enviable position if it meant that you were confronting us with our ugliness as well as our beauty. Number one may be something to aspire to if it meant that truth was not in the gore of the wound but in the exploration of the wounding and the speed of trying to find the healing. Oh it is too much to bear. It is time for us to rethink what stories we tell and how we tell them. To ask who or what is truth and what right do we have to utter it? Because every time you think there’s nowhere else below for us to go, the bottom falls out again and we descend further into our la basse of unfeeling. Every time you think it couldn’t possibly get any worse, that children couldn’t possibly be more of an abused and voiceless group, some adult is there to prove you wrong. You have to wonder if the devil is really real. If the devil busy in truth, just running about kicking Trinis in their backsides prompting them to do the most evil of acts, under the guise of truth-sharing. Who is wrong in this situation? Is it the mother for having the child in her lap out of a car seat, out of a seat belt? Is it the photographer for capturing the face of a dead child laying in the grass? The editor who thought it would make a great front page? The child for being born in the first place? Somebody’s child, oh God. You turn away from her face. Her perfect cherub cheeks. But she stays with you. Haunting you, keeping you awake at night. There is no justice for angels who land in highway grass. There is no love for innocence in this gory time. Turn away, close your eyes. Try to forget her eyes forever closed. Like their hearts that cannot understand why this is wrong. Protect your heart from the hurt, because they think they are right and they in their putrid tabloid righteousness will do this crime again. And get away with it. Leaving us hurting, crying, grieving for innocence lost that can never be regained in the thousands of hands of their readers. I was standing on the Shore of Peace feeling not very peaceful. Watching the family of Grace Dolsingh prepare her body for cremation, the air heavy with the scent of flowers and camphor and death. Grace Dolsingh, who I knew only as a vibrant, committed elder of her community who decided that she didn’t want a smelter in her back yard. Grace Dolsingh who was at every meeting, every protest, articulating in a way that only sweet grandmothers can articulate their concern for future generations. Watching huge grey clouds gather in the Gulf of Paria refusing to burst like all the sorrow I feel for home that doesn’t want to pour down my cheeks. Watching other families put their loved ones to rest. 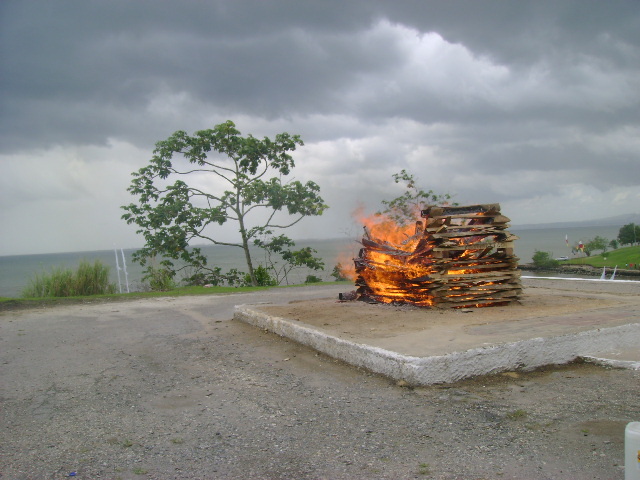 There are several cremations taking place on the Shore of Peace and it is such a tief head that these people were walking the earth a few days before. I dislike funerals as much as the next human running from coming to terms with mortality. I dislike even more when there is a possibility that death could have been avoided. I resent it when death turns up unexpectedly, uninvited. Death is inevitable but an unnecessarily prevalent reality in the lives of too many Trinbagonians these days. Because I do think that some people know when it’s their time to ride out. To leave aside this place and return to the big void or heaven or the vast nothingness of non-existence. I don’t know if Grace Dolsingh was ready to go. And I as I stood on the Shore of Peace talking with her family and friends, they say that they didn’t expect her to die. This being modern times, civilized times when we exceed our expectations and make it to developed nation status ahead of our dear politicians projections, you would think that we would have the technology or the medical know how to ensure that people survive mild heart attacks. But when Grace Dolsingh was taken to the Point Fortin Hospital and made to sit on a chair for 25 hours after having a heart attack, clearly someone was playing a sick little underdeveloped joke. At the Point Fortin Hospital just up the road from those monuments to our industrialized economy, I hear women are still having babies on the floors. At the Point Fortin Hospital, still devoid, after a century of commercial oil production, of a burns unit, maybe the doctors say prayers to God who is a Trini that we don’t have any real disasters. I was standing on the Shore of Peace trying to come to terms with Grace’s death. As if death is something you can come to terms with, when you’re sad and angry and powerless. Watching the pundit’s assistant hit a flat brass plate with a tiny hammer. Wondering about karma and reincarnation. Wondering if politicians who can afford to send themselves away from treatment, when they eventually die, do they come back as their constituents that they show so much contempt? Do they come back to live under the infernal roar of a gas flare with nothing but faith and mango trees to keep them sane. No answers come in the constant drone of amplified prayers. My eyes smart from the smoke and the camphor and the reality of my mortality. I know from the hundreds of people who are turn out to say a final goodbye to Grace Dolsingh that she lived a good life. I wonder if politicians hope for such noble endings. Or do they, like young gangsters simply put aside plenty money so that they can afford an expensive suit and a blinged out coffin. Signs of a life opulently lived, with no evidence of the terror inflicted on the lives of so many families. Her face has a kind of peace that suggests a pleasant dream, which is what I imagine death to be. I find that I have no tears for Grace Dolsingh or for myself. But I hope that when my time comes, later rather than sooner, I am able to give as good an account of myself to my peers, my community, loved ones and country. And not only for karma’s sake, I find that I want to keep fighting.